Ollie Bolton was born on May 5, 1874 in a neighborhood called Hoop Creek in Hancock County, Tennessee near the Claiborne/Hancock County line in 1874 to Joseph B. “Dode” Bolton and Margaret N. Claxton/Clarkson. We don’t know the middle names of either of her parents. Ollie was my grandmother, my father’s mother, but I never knew her. She died in April, 1955, before my birth. She is the least known of my grandparents. My Estes family told me stories of her first husband, my grandfather, William George Estes, who she married in Claiborne County, Tennessee on September 26, 1892, but there was no one to tell me stories about Ollie. We don’t even know Ollie’s middle name for sure. In some places it’s recorded as Florence, but on my father’s Social Security application, he gives it as Ollie Elsie Bolton. Ollie applied for a social security number on July 31, 1939. She is living at 117 S. Hamilton in Chicago. She is not employed and is age 65 at her last birthday. She gives her birthdate as May 5, 1874 and her parents as Joseph Bolton and Margreat Clarkson. No, that is not a typo. Ollie’s life was hard. She lost her first baby at six weeks of age, the year after she was married, a month and 6 days before her first wedding anniversary. Her second child followed in 1894. Not long thereafter, Ollie and William George Estes moved to Springdale in Washington County, Arkansas where Ollie ran a boarding house and tended to her children, with little help from William George. They moved back to Claiborne County and were living there in 1900, but William George was out of work more than he wasn’t, and he drank. The 1907 photo of Ollie doesn’t portray her as a happy woman. 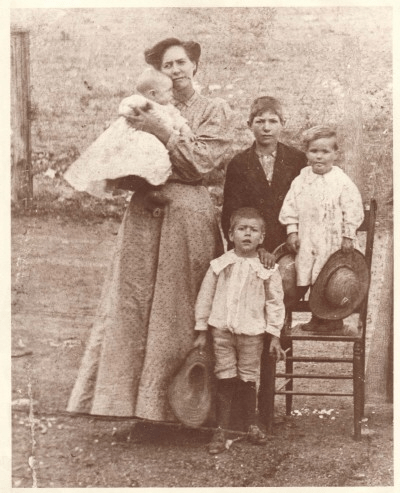 Of course, photos can be poor or deceiving, but as of the time this photo was taken, 3 of the 7 children she had born were dead, and one had died tragically. According to the 1910 census, three of Ollie’s children had died. 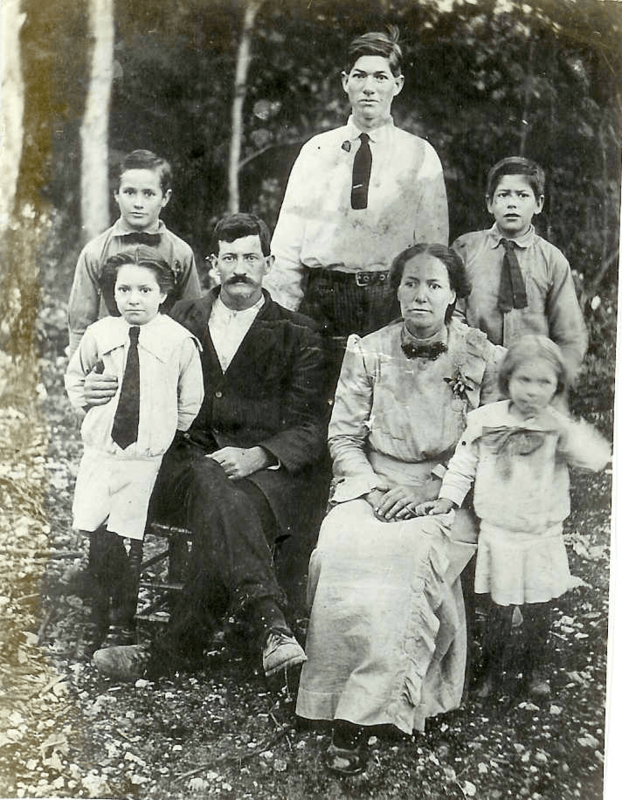 We know who two of them are, Samuel who died at 6 weeks of age, and Robert who died when their cabin burned, but there appears to be a third child who died as well – probably born in the spot between 1894 and 1898 – and probably buried in Arkansas. It’s sad, that child is lost to us and we only knew of their existence from the census records. Margaret says the family Bible was destroyed in the fire. It would have told us more. The death of the child in the cabin fire must have been torturous for Ollie. The family in Estes Holler says that Ollie had left the children to go to a party. They don’t say where William George was. Odd that her absence is mentioned, somewhat scornfully, but his was simply accepted without mention. It looks like Robert died before 1907. He was born in 1898 and the photo of the children in 1907 is without Robert. 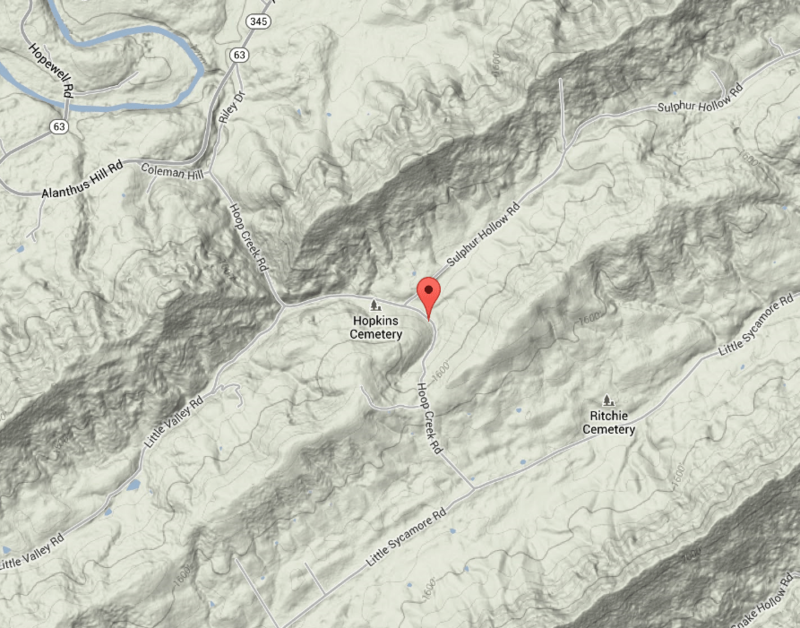 We know he died after they returned to Claiborne County, which was before the 1900 census. Cousin George showed me where the cabin that burned had stood, and the willow he planted in honor of the child who died. I have often wondered if I was named after this child. It was my father that selected my name of Roberta. Shortly after the 1910 census, the family moved to Fowler, Indiana and were tenant farmers. There appear to be some happy times there. Well, Ollie looks happy even if William George doesn’t. Ollie and William George are on the left and their friends, the Friar’s possibly, on the right. 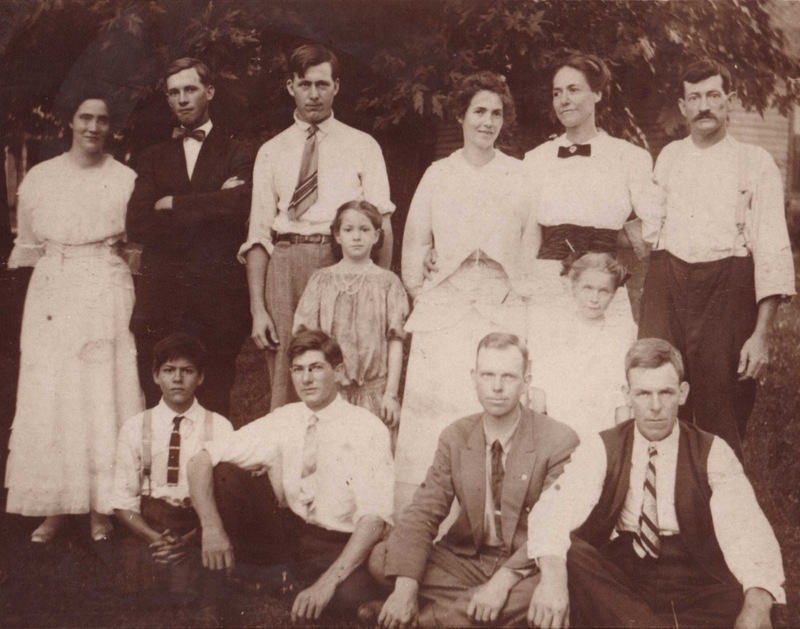 This family photo is labeled “1913, Fowler, Indiana.” The adults, other than Ollie and George to the right in the back row, are Ollie’s cousins, with the exception of a family friend. One of their sons, Joseph was missing in this photo, reportedly at scouts. My father, William Sterling Estes is the youngest male in the front row on the left beside his brother, their oldest son, Estle. Beside Estle at the right of the front row are cousins Lee and George Smith. The Crazy Aunts, adversaries for life, Margaret, brunette on the left and Minnie, blonde on the right, are standing in the second row. 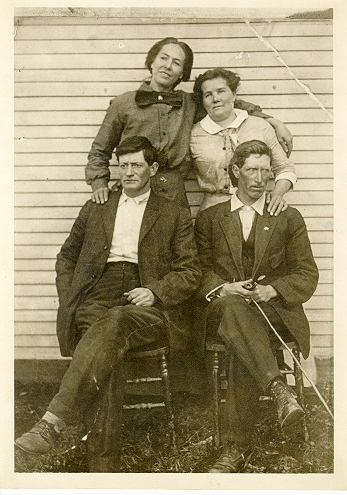 In the rear, left to right, cousins Clara and Mont Bolton, friend Ted Barneo and cousin Elizabeth Baker. This is the only existing photo of the entire family. Margaret said that it was taken by setting a timer on William George’s camera. This photo was also taken about 1913. Shortly thereafter, the family scuttlebutt is that Ollie’s young cousin came to visit. By young, the young lady was born about the time that Ollie and William George were married. Ollie came home and discovered her cousin and William George in “the act.” Ollie grabbed either a bullwhip or a horsewhip, stories vary, but it really doesn’t matter, and proceeded to use it on him/them. The only thing that saved them was that there were others nearby. The Crazy Aunts tell us that it took “5 grown men” to restrain her. Never underestimate the wrath of a woman scorned. Ollie Bolton and William George Estes had the following children, for sure, in Claiborne County, Tennessee, unless noted otherwise. There are other family stories surrounding this time as well. One story says that Ollie was pregnant with twins, that she lost after the scandalous “cheating husband” event. Another story says that another child, Elsie, was born and eventually died, and that Elsie was “retarded.” From what was said, Elsie likely had Downs Syndrome. One Crazy Aunt said Elsie died in Chicago, but there is no death record to support this, or any photos, nor any other indication that this child existed. Another rumor said there was also a second set of twins that died. By 1914, Ollie was 40 years old. She could well have had a Downs Syndrome baby. However, neither Benton County, Indiana, nor Cook County, Illinois records show the birth or death of any Elsia Estes or infant twins. The photos above and below were labeled by Aunt Margaret as “Ollie Bolton Estes and Margaret 1918 Franklin Park, Illinois.” I have always questioned whether this was Ollie or Ollie’s mother. Another cousin has this same photo labeled differently which might imply that the women is Ollie’s mother, Margaret Claxton/Clarkson. The identifier “grandmother” is a matter of perspective. However, Crazy Aunt or not, Margaret was there in the photo and she should have known if it was her mother or grandmother. I have a note in my file that Ollie moved to Chicago in 1919, and Margaret sent a photo of Minnie in Chicago in 1922, if she is correct about where it was taken. I cannot find Ollie in the census in 1920. In the 1930 census, Ollie had remarried and she and John Robbins lived on Flournoy St. in Chicago. They had been married for 6 years which tells us that they married in 1924. She was 55 and he was 47. He was a clerk with the railroad. Minnie said she married John Robbins in Chicago, but Chicago marriage records don’t include their marriage. 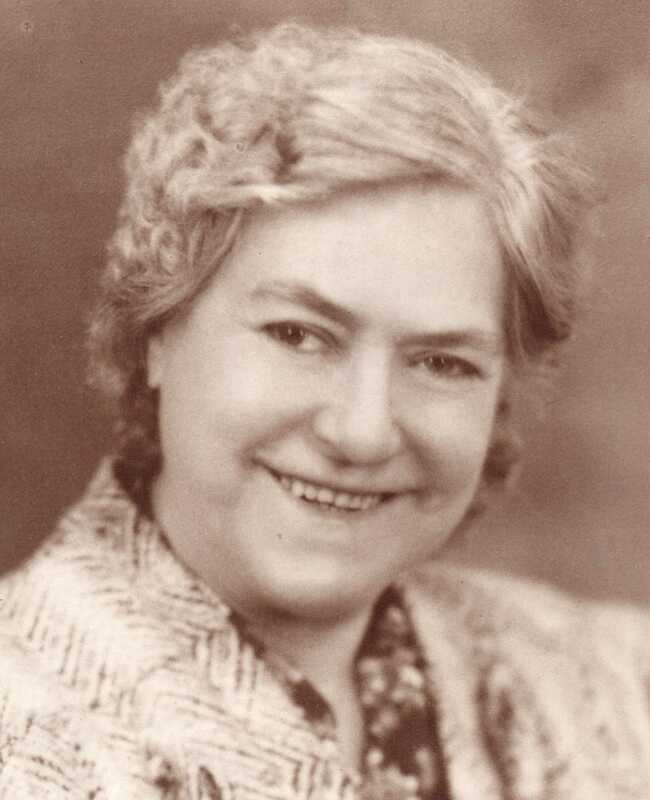 Ollie was noted in her sister’s obituary in 1935 as Ollie Robbins. However, in 1953, she is called Ollie Estes in her sister, Ida’s obituary. In 1939, Ollie applied for a Social Security card in Chicago. We know she could write, based on this document. In the 1940 census, John and Ollie Robbins are living at 117 Hamilton. He is 56 and she is 66. They indicate they lived in the same location in 1935. Ollie says that she completed the 8th grade. The 1940 census included several employment questions. It looks like neither of them were working and neither are seeking work. Ollie indicates she is unable to work. They rent for $12 a month, which is about half of what other rents seem to be. There were a few at $10 but mostly they ranged from about $16-$25 with $25 being very common. By the time my mother met Ollie, about 1950, Ollie was already ill. Mother didn’t know if John Robbins had died or they were divorced, but he was not in the picture. Ollie lived with my mother and father during her last illness during my mother’s pregnancy. Ollie’s death certificate lists her death date as April 9, 1955 and her address as 639 N. Kedzie in Chicago. 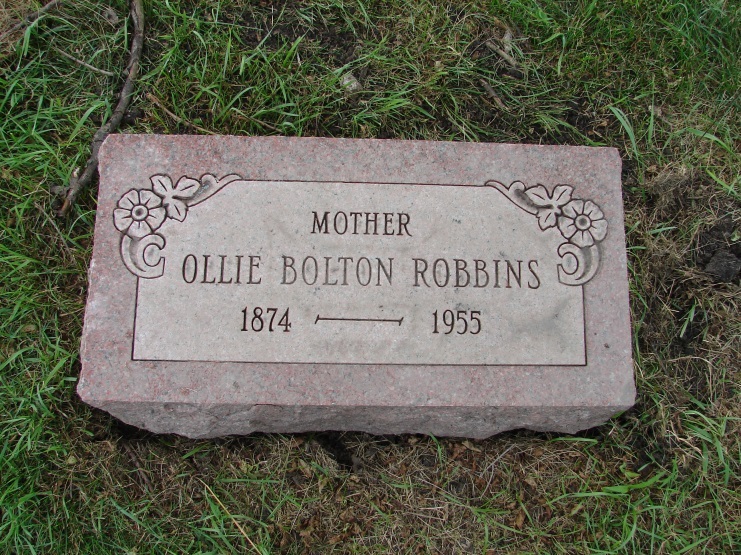 Ollie Bolton Robbins, widowed, born May 5, 1872, age 82, was a housewife at home, born in Tennessee and lists her parents as Joseph Bolton and Margaret Claxton. She was never in the armed forces and the informant was William S. Estes, listed at the same address, and he signed as her son. Note that her birth year is off by two years on her death certificate. I’ve seen this situation many, many times. Ollie is buried in the Elmwood Cemetery in Chicago. John Robbins is not buried there. I visited several years ago and let me say that this grave was not easy to find and the Chicago traffic was abysmal. I’d rather climb over fences and brave brambles any day. Cemetery records show that my father bought the lot and the stone, although one of the Crazy Aunts claims that she did, along with two extra plots, asserting that “someone” had then sold the extra plots and pocketed the money. That’s not what the cemetery records showed, however. It’s beyond me why anyone would purchase extra plots there. There was no one else to bury. But then again, that’s why we call them the Crazy Aunts! They did make life very interesting with their various wild goose chases! Every now and then, one produced a goose, or at least a few feathers. My father carried all of Ollie’s X chromosome. Men only inherit an X from their mother, because they inherit the Y chromosome, which makes them male, from their father. Therefore, I too carry Ollie’s X chromosome, intact, because my father only had one X chromosome to give me. Therefore, one of my 2 X chromosome is actually Ollie Bolton’s X and theoretically half of what I gave to my children is Ollie’s. In reality, my children could have inherited anyplace between all and nothing of Ollie’s X, but I definitely carry it intact. My father’s autosomal DNA has never been tested, as he died in 1963, but by phasing my mother’s DNA against mine, I can, in this case, determine my father’s X chromosome and therefore, Ollie’s too. Phasing is a process where, by process of elimination, when you don’t have both parents DNA, you can determine which DNA belongs to which parent. For every DNA location, every person carries two nucleotides, either T, A, C or G. So let’s say that I carry a T and a C for one particular address. If my Mom carries two Cs, or a C and an A, then we can say for sure that the T came from Dad. This method isn’t foolproof, because if Mom carried both a T and a C, we have no way of knowing which she gave me and which came from Dad, but it’s better than nothing. Therefore, when dealing with X matches, if an X match doesn’t also match my mother, then I know it came from my father, and therefore, also from Ollie. It’s interesting, the innovative ways we are discovering to identify, “obtain” and utilize the DNA of those long gone. This entry was posted in X Chromosome and tagged 52 Weeks of Ancestors, Examples by Roberta Estes. Bookmark the permalink. Bolton in TN. One of my father’s female lines is my brick wall Mary Ann Bolton. She was born abt 1831 in either TN or IN. I believe that her father was Abnatha Bolton who married Fannie Stone. Abnatha was born in 1808 in SC and died in 1886 in IN. HIs father may have been James Bolton b. 1785 in Wake NC m. C. Pendergrass. Mary Ann Bolton married my ancestor Caswell Cooper in IN. He died at 44 years old due to measles contracted in the Civil War. Mary Ann preceded him in death, and his 2nd wife Sarah Jane (widow of Abner Johnson) moved Caswell’s children to Butler county MO where many of their descendants remain today. My father’s mother cas the granddaughter of Mary Ann Bolton and Caswell Cooper. I wonder if your Bolton and my Bolton line were related? If you can find a male Bolton to test, we’ll have an answer quickly. This is a wonderful way to tell a family story with history, pictures, dna, and more on the crazy aunts. I am sure I would have liked them because I like to ead about them. I sometimes wonder if the Aunts were sane & everyone else crazy? 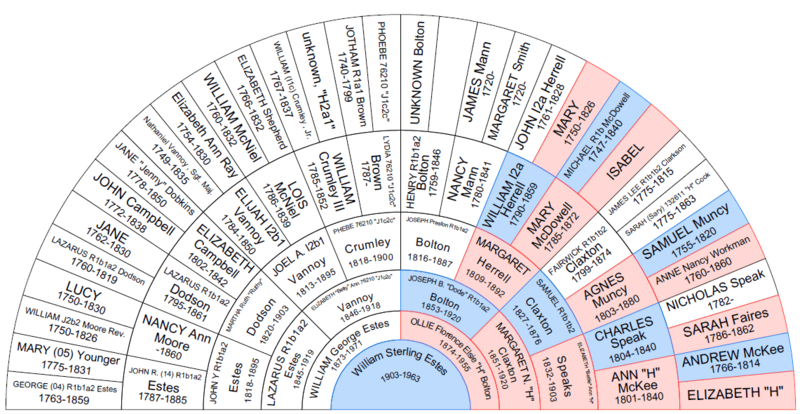 🙂 Re: your Lancashire relatives that tested did they do Family Finder as well as Big Y? I enjoyed this story and lesson. Very nicely presented. 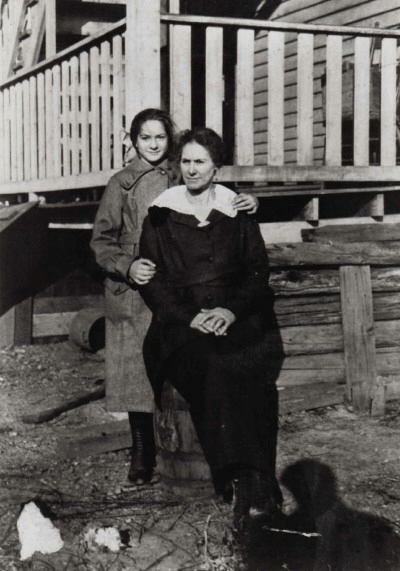 i AM NOT THAT GOOD AT THIS (OR GOOD AT ALL), BUT MAYBE A READER WHO IS COULD HELP DATE THE PHOTO BY THE FASHIONS AND HELP DETERMINE IF IT IS OLLIE OR HER MOTHER. 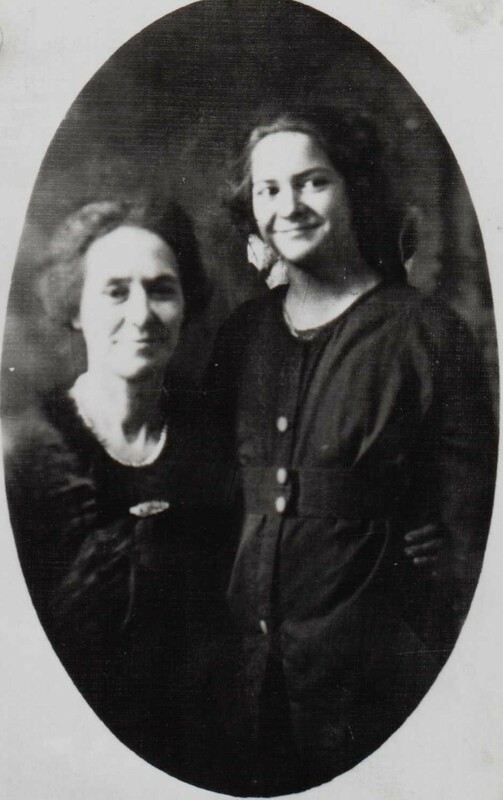 BY 1918 THERE WOULD HAVE BEEN MORE THAN ONE TYPE OF PHOTOGRAPHY AVAILABLE – IS THIS A TINTYPE? THAT COULD HELP AS WELL. I KNOW THERE WERE SEVERAL WEBSITES WHERE YOU COULD POST A PHOTO AND PEOPLE WOULD HELP IDENTIFY BY FASHIONS AND PHOTO TYPE BUT HAVEN’T BEEN TO ONE IN YEARS. Dear Roberta, I am trying to understand the X factor so am I correct in saying I received one X from my dad who received that X from his Mom. His Mom got her X 100% from her Dad and he got his X from his Mom. Is this how the X goes? Roberta, Robbins name caught my eye. My Robbins Ancestor, John born PA died Indiana, his father, Daniel came from the Channel Islands Guernsey. The family information came from a Robbins that I corresponded with in 1984. He would be over 100 now so imagine he is gone.